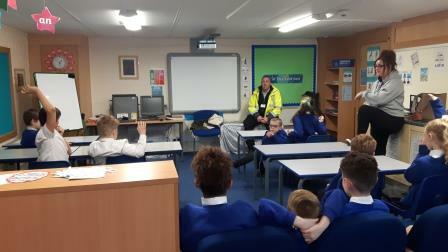 Heather Stout, from the Ovenden Initiative, arranged for CMBC Community Warden, Lee Ackroyd, to visit the Whitehill Community Academy Junior Wardens to talk about his role in the community. Lee told the Junior Wardens about the various aspects of his role and how he helps to keep the community of Illingworth, as well as other parts of North Halifax, a nicer place to live. Amongst other things, Lee told them his role includes reporting dog fouling, fly tipping, build-up of rubbish likely to cause a fire risk, helping the police when required, checking on vulnerable residents, reporting graffiti and anti-social behaviour. Lee can also issue Fixed Penalty Notices for dog owners who do not pick up after their dogs. When he is not doing any of the above (!) he will also be found at this year’s Tour de Yorkshire, where he will be helping out with marshalling to keep the crowds safe. The Junior Wardens were very interested in Lee’s role in the community, with some telling him of their own experiences of some of the issues he deals with.